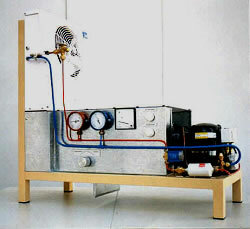 For profund training in air-conditioning it is necessary to understand the processes aircooling and airheating. Aircooling is a precondition for dehumidifying and airheating a precondition for humidifying. These physical facts base on the effect that air absorbs the more water the higher is its temperature . Exceeding the limits effects condensate or rain. TeLC has designed two units to do training in these subjects. Both devices can be used combined or isolated. The above photo shows the aircooler.